A total of 107 HCC specimens were collected for tissue microarray analysis and immunohistochemistry (IHC) analysis. The relationship between MFN2 expression and clinical features of patients with HCC was analyzed. Expression level of MFN2 in HCC tissues was 0.92 ± 0.78, significantly lower than that of matched paracancerous liver tissues (1.25 ± 0.75). Patients with low expression of MFN2 had significantly higher rates of cirrhosis than those with high expression of MFN2 (P = 0.049). Kaplan-Meier survival analysis showed that HCC patients with low expression of MFN2 had a worse prognosis in overall survival than HCC patients with high expression of MFN2 (P = 0.027). Patients with high expression of MFN2 had a better prognosis in disease-free survival compared with HCC patients with low expression of MFN2 (P = 0.047). Vascular invasion and MFN2 expression were shown to be prognostic variables for overall survival in patients with HCC. Multivariate analysis showed that vascular invasion (P < 0.001) and MFN2 expression (P = 0.045) were independent prognostic factors for overall survival. Vascular invasion (P < 0.001) and MFN2 expression (P = 0.042) were independent risk factors associated with disease-free survival. 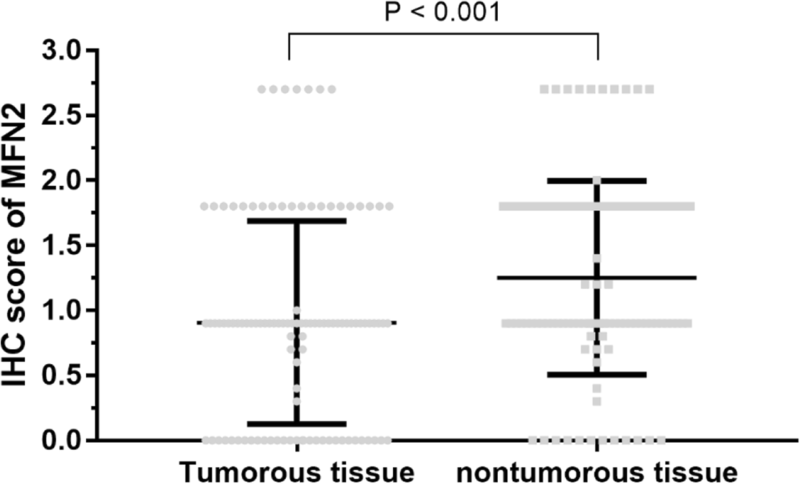 Our data revealed that MFN2 expression was decreased in HCC samples. High MFN2 expression was correlated with longer survival times in patients with HCC and served as an independent factor for better outcomes. Our study therefore provides a promising biomarker for the prognostic prediction of HCC and a potential therapeutic target for the disease. Hepatocellular carcinoma (HCC) is one of the most common malignancies in the world [1–3]. Approximately 437,000 people are diagnosed with HCC each year worldwide, of which approximately 50% occur in China [4, 5]. Although the therapeutic methods of HCC have improved with advances in surgical methods, interventions, ablation, etc., the 5-year survival rate of patients is very low [6, 7]. In China, HBV infection is the most important etiology of HCC [8–11]. Nearly half of HCC patients are infected with HBV, and the geographical distribution of HBV infection is also highly correlated to the geographical distribution of HCC [12–14]. However, the molecular mechanisms by which HBV infection induces HCC remain unclear. Therefore, understanding the mechanism of hepatitis B-related HCC development is particularly important for early screening, clinical diagnosis and prevention of HCC. Mitochondrial fusion protein 2 (MFN2) is localized on the mitochondrial outer membrane and is involved in the regulation of fusion of mitochondrial outer membrane [15, 16]. MFN2 promotes cellular apoptosis and inhibits cell proliferation [17, 18]. Studies showed that the expression of MFN2 in colorectal cancer tissues and breast cancer tissues is significantly lower than that in normal adjacent tissues [19, 20]. These results suggest that MFN2 plays an important role in the occurrence and development of malignant tumors. However, the role of MFN2 in liver cancer has not been reported yet. This study was designed to explore the expression level of MFN2 in the cancer tissues of patients with hepatitis B-related HCC, analyze the relationship between the expression level of MFN2 and clinicopathological features, and investigate its role in the regulation of hepatitis B-related HCC. We collected a total of 107 HCC tissues from August 2000 to Jun 2010. All patients were sero-positive of hepatitis B surface antigen. None of the patients received any chemotherapy or radiotherapy before collection of the tissue. The follow-up period was defined as the time interval between the date of operation and the date of death or the last follow-up. The study was approved by the medical ethics committee of Yantai Yuhuangding Hospital. Since all specimens used were anonymous, the Medical Ethics Committee exempted patients from the need for informed consent. Tissue microarray (TMA) was constructed. Each tissue core (diameter: 0.6 mm) was perforated and re-embedded from the labeled area by using a tissue array. The specimens were fixed with 4% paraformaldehyde. The biotin blocking Kit (Dark, Germany) was closed. After closure, the tissues were incubated with MFN2 antibodies (#9482, 1:1000, CST, USA) in a humid chamber at 4 °C for the night. The tissues were washed with PBS three times and incubated with biotinylated goat anti-rabbit antibodies for 1 hour. Finally, the slices were stained with hematoxylin and observed under a microscope. Semi-quantitative IHC was used to assess MFN2 protein expression levels according to the following criteria: “0” (negative staining), “1” (weak staining), “2” (moderate staining) and “3” (strong staining). The final score was calculated as the percentage of positive expression multiplied by the intensity score. The median IHC score was used as a cut-off value for determining high and low levels of expression. Statistical analysis was performed using SPSS software (version 13; SPSS Inc., Chicago, IL, USA). Student’s t test or Chi square test was used to examine the correlation between MFN2 expression and clinical and pathological variables. The Kaplan-Meier method (logarithmic rank test) was used to construct the survival curve. Multivariate Cox proportional hazards regression model was used to assess the independent predictive value of MFN2. P value less than 0.05 was defined as statistically significant. The expression level of MFN2 in 107 pairs of HCC tissues and matched paracancerous liver tissues were measured by IHC staining. The results showed that the expression level of MFN2 in HCC tissues was 0.92 ± 0.78, significantly lower than that of matched paracancerous liver tissues (1.25 ± 0.75, P < 0.001, Fig. 1). According to the median score (0.9) of MFN2 expression in HCC tissues, all enrolled HCCs were divided into MFN2 low expression group (MFN < 0.9) and MFN2 high expression group (MFN ≥ 0.9). Demographic data and clinical features of the patients in the two groups were compared. We found that patients with low expression of MFN2 had significantly higher rates of cirrhosis than those with high expression of MFN2 (P = 0.049), as shown in Table 1. There are 107 paratumor tissues we have collected and enrolled, 85 of them were diagnosed with cirrhosis and 22 were not diagnosed with cirrhosis. The MFN2 IHC scores were 1.27 ± 0.75 in cirrotic tissue and 1.18 ± 0.74 in non-cirrotic tissue (P = 0.605). To determine the prognostic value of MFN2 in HCC, we performed a Kaplan-Meier survival analysis. The results showed that HCC patients with low expression of MFN2 had a worse prognosis in overall survival than patients with high expression of MFN2 (P = 0.027). We also compared the difference in the disease-free survival between the MFN2 high-expression group and the low-expression group. The results showed that patients with high expression of MFN2 had a better prognosis in disease-free survival compared with patients with low expression of MFN2 (P = 0.047), as shown in Fig. 2. To evaluate whether MFN2 expression was an independent risk factor for outcomes in HCC, both univariate and multivariate analyses were conducted. The vascular invasion and MFN2 expression were shown to be prognostic factors for overall survival in patients with HCC. The multivariate analysis showed that vascular invasion (P < 0.001) and MFN2 expression (P = 0.045) were independent prognostic factors for overall survival (Table 2). We further explored the risk factors associated with disease-free survival (Table 3). Univariate analysis showed that vascular invasion and MFN2 expression were risk factors associated with disease-free survival. Multivariate analysis also showed that vascular invasion (P < 0.001) and MFN2 expression (P = 0.042) were independent risk factors associated with disease-free survival. Mitochondria are involved in the regulation of cellular energy metabolism, signaling, and programmed cell death [21, 22]. The shape and size of mitochondria are regulated by complex and sophisticated systems [23, 24]. MFN2 is a protein located in the outer membrane of mitochondria and is mainly involved in the regulation of fusion of mitochondrial outer membrane [15, 17]. HCC is a disease with significant heterology due to the various etiology and other mechanism [25, 26]. There is growing evidence showing that MFN2 is involved in a range of pathologies, including tumorigenesis, diabetes, cardiovascular disease and so on [15, 17, 18]. In this study, we found that MFN2 is downregulated in HCC and the low expression is associated with poor prognosis. The results provided direction for future research of HCC mitochondrial dysfunction, and MFN2 may serve as a promising biomarker for HCC. MFN2 is located at the 36.22 locus of human chromosome 1 short arm. Cytogenetic analysis found that human chromosome 1 short arm 3 region 6 is the mutation-prone area of many malignant tumors [15, 17, 18]. Therefore, MFN2 is suspected to be a tumor suppressor gene. The results of this study showed that MFN2 is expressed at low level in liver cancer and is associated with poor prognosis, suggesting that MFN2 is a tumor suppressor gene in HCC. We also found that MFN2 is associated with cirrhosis. Whether MFN2 is causative to cirrhosis requires further research. Previous studies have shown that MFN2 plays an important anti-proliferative effect in breast cancer cells [27, 28]. MFN2 significantly inhibit the proliferation of breast cancer cells in vitro and increase the chemo-sensitivity of cancer cells to induce their apoptosis [27, 28]. In addition, studies also showed that exogenous MFN2 can inhibit the proliferation of gastric cancer cells and induce apoptosis in vitro by promoting the flow of calcium ions from the endoplasmic reticulum to mitochondria, thereby disrupting the mitochondrial calcium ion homeostasis [29, 30]. However, the role of MFN2 in HCC is still unclear. This study demonstrated that low expression of MFN2 is closely related to the poor prognosis of patients with HCC, and the specific molecular mechanism warrants further study. In addition, since all patients enrolled in our study were HBV-related HCC patients. Therefore, we conclude that MFN2 can be used as a prognostic biomarker for HBV-related HCC. However, for HCV or non-viral related HCC, whether MFN2 can be used as a biomarker for prognosis still needs further study. Since in China, the majority of HCC is caused by chronic HBV infection. Therefore, exploring the expression level and significance of MFN2 in HCC caused by other etiologies still needs a multi-center clinical study to confirm. There are some limitations in this study. Firstly, the sample size is relatively small, so the results may be biased. Secondly, the data collected in this study came from a single center and this may lead to some enrollment bias. A multicenter prospective study is needed to further validate the role of MFN2 in HCC and its potential prognosis prediction value. In summary, our study results revealed a role of MFN2 in the development of HCC. Our data showed that MFN2 expression was decreased in HCC samples. High MFN2 expression was also correlated with longer survival times in patients with HCC and served as an independent predictor for better outcomes. Collectively, our data suggest that MFN2 is a promising biomarker for the prognosis of patients with HCC and a potential target in HCC treatment. Xiumei Wang and Youde Liu contributed equally to this work. Authors would like to thank help and support from hospital for the study. Authors can confirm all relevant data are included in the article and materials are available on request from the authors. WZ designed the study and edited the final version of the manuscript; XW and YL conducted the sample analysis and drafted the paper;JS, WG and PS contributed to the statistical analyses; XK and MY provided the clinical samples. All authors read and approved the final manuscript. The study was reviewed and approved by the Medical Ethics Committee of Jining No. 1 People’s Hospital. Since all specimens used were anonymous, the Medical Ethics Committee exempted patients from the need for informed consent.